Fisher Shipping Company offers enclosed vehicle transport for vehicles to any destination in the United States. If you’re ready to move, please call us at 1 (888) 886-3456 to schedule your enclosed vehicle transport. If you need help deciding between enclosed or open transport, read on to learn whether enclosed vehicle transport is the right choice for your next vehicle move. What is the difference between open and enclosed auto transport? The typical car carrier that you see on the road is an open car carrier. Open trailers are exposed to the elements and the vehicles usually arrive very dirty when traveling more than a few hundred miles. Enclosed vehicle transport (also known as covered or closed car shipping) uses enclosed trailers with walls to ship your vehicles. These trailers hold fewer vehicles than an open trailer and can be 50%-100% more expensive. 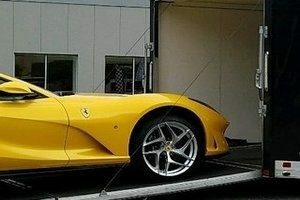 Trailers used for covered auto transport will usually have a large cargo insurance limit, since they are generally used to transport exotic cars, classic cars and high value cars in general. What are the benefits of enclosed auto transport? The main benefit when you choose covered or enclosed vehicle transport for your vehicle is additional protection. Transporting a classic car or an exotic car is scary! These vehicles are very expensive to repair. There is cargo insurance in place to protect you when transporting a vehicle across the country, but this type of insurance has a major exception. Cargo insurance does not cover road hazards. 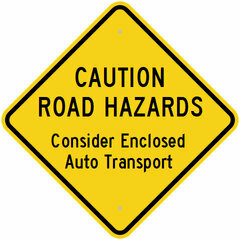 A road hazard is something that flies up off the road and damages the vehicle. It’s not something that happens too often, but it does occasionally occur. Covered auto transport eliminates that potential risk. Another benefit is that by moving your vehicle on a closed car carrier, it will sometimes get there a little quicker. These trucks cannot hold as many vehicles as an open car carrier, therefore there are fewer pickups and deliveries along the way. Learn more about open vs enclosed car shipping. What are the advantages of enclosed auto transport? The biggest advantage to shipping your car on an enclosed truck is that you don’t have to worry about road hazards. Road hazards are objects that fly off the road and hit your vehicle during transport. Cargo insurance policies don’t cover these. Cargo insurance protects your vehicle in the event that the driver does something that leads to your vehicle being damaged, such as hitting a rail on the truck when loading the vehicle. However, a driver is not at fault if rocks kicks up and chip the paint on your bumper. It’s not something that happens often, but occasionally it does happen. By transporting your vehicle on an enclosed car carrier, you don’t have to worry about this. If your vehicle has a custom paint job, you may want to ship it on an enclosed car carrier. 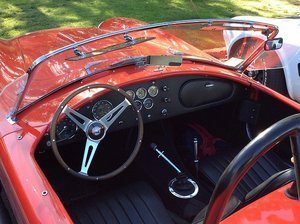 Enclosed vehicle transport is most often used for vehicles valued over $50,000 as well as classic or antique cars. We can transport almost any type of vehicle on a closed car carrier, but there are height restrictions with these types of trailers. Oversized vehicles can be difficult to move on these types of car haulers. We have minimum insurance requirements based on the size of the trailer for all companies that haul cars for us. The trailer size sets these limits. The requirements for enclosed trucks are much higher than open car carriers due to the fact that the vehicles transported on. What is the difference between “Hard-side enclosed” and “Soft-side enclosed” auto transport? If you have decided on choosing covered auto transport, you may be wondering what the difference is between hard-side and soft-side trailers. A hard-side enclosed or covered trailer has actual walls. There’s virtually no way anything is going to kick up off the road and damage your vehicle. It protects your vehicle from rain, snow, or hail and arrives in the same condition as when it left. A soft-side enclosed trailer is basically and open trailer with a tarp on the sides. It will offer you protection from road hazards in most cases, but not complete protection from road hazards or the elements. Fisher Shipping only uses hard-side enclosed trailers when transporting your specialty vehicle, high value car, or everyday vehicle. We believe that half measures avail us nothing! We hope that this gives you a better idea of the differences between open and covered car transport. 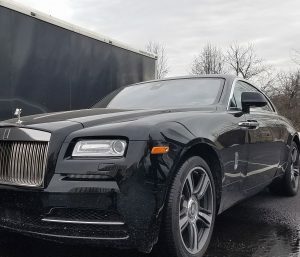 We offer both services for transporting your car and expect that you will be very happy with your decision to choose Fisher Shipping Company. Look at our reviews. Please call us at 1 (888) 886-3456 if you have any questions or would like to schedule your next auto move!